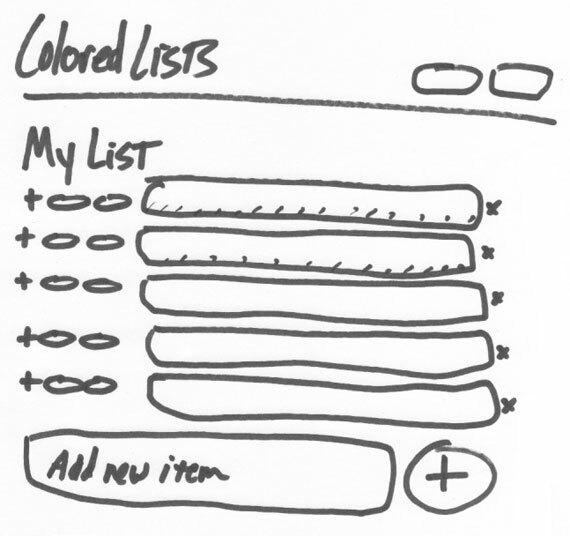 This "list app" is going to be called Colored Lists. Lists (in real life), can be for anything: a to-do list, a grocery list, things to bring camping list... As you finish things, you cross them off. Things on a list may be of different relative importance as well. This makes paper lists potentially messy and inefficient. With a list on a computer, we can make crossing off items just a click and we can make rearranging them a matter of drag and drop. For dealing with relative importance, we can use colorization, which could also be used for things like grouping. Computers and the web are a perfect place for lists. Looks like a list to me. Each list item is a long rectangle because the big idea here is to colorize each list item, so putting them inside a colored box makes sense. There are some interactive elements to the left and right of each list item. Those are going to be for accomplishing the basic things we intend people to be able to do with their colored list. Let's take a closer look. All this stuff basically adds up to a whole bunch of AJAX. We don't want to load special screens to do relatively trivial tasks like deleting a list item. That stuff should happen seamlessly, smoothly and with proper feedback in response to mouse clicks without page refreshes. In a sense, we are creating a one-page app, where the majority of interaction with this app happens on a single page. This is certainly by design, and not trying to adhere to any particular fad. Lists are easy and quick, that's why they are useful. If this app is complicated, it's usefulness is diminished and nobody will use it. Just doing some quick brainstorming of the idea so far, we can come up with quite a number of "screens", or states the application can be in. Yep, even emails should be considered a part of the "screens", as they are a vital part of the process and interaction with an app. People love "features". Things that your app has that other apps don't have, or that yours does better. This is just as much for marketing as it is for your actual product. All the fancy AJAX this app will have is certainly a feature, but that stuff these days is getting more and more expected rather than a feature. The one feature that we will focus on with this app is "public sharing". Each list will have a unique URL that can be publicly shared. A visitor visiting this URL can see the list in its exact current state, but not interact with it as far as editing/adding/deleting. Now that we have the idea in place of what we want to build, in the next part we'll dive into looking at what this is going to take in terms of server-side technology. cant wait for the next part. thanks a lot for this and your entire site. i learned a lot from you. Wow, great start of a series I’m sure will be great. Can’t wait for part two! Sounds like fun. Definitely something different from usual content. This looks interesting. I am going to try to follow this. YES. Looking forward to more! I do realize that it’s not quite the point, but shouldn’t you be able to “Check off” a list item? Nice. Can’t wait fo it. Good Tutorial. looking forward to the rest of this series. Ive Never heard of ennuidesign, nice site! btw. We hope so! Friday we’ll put the app out there for you to actually play with and potentially use too, so it’ll all come together that way. this looks like its gonna be a good series, thanks! Thank you for this! This site continues to amaze me.. this example cited. Perfect timing! With the news of Google Chrome OS being based around web apps only I think it will be interesting to see what goes into the design process for this level of app. Cannot wait for the next part in the series! Roll on Part 3! Waiting eagerly for the next installment. It’s refreshing to see the workflow, ideas and actions needed for app building…but then CSS-Tricks never fails in such matters. Always informative, idea-inducing, and thorough in explanation. this is simply awesome post. thanks for sharing. eagerly waiting for your next part of this series. I need/want a to-do list that fits my needs and that I can run on my own site. This seems like the perfect solution. I’ll be keeping an eye on the series, following along and building right along with you. Great article as I have been trying to figure out how to tackle a web app for some time now. cool, I was just looking for a project idea to sharpen my codeigniter skills, so I’ll try to follow along in CI. this is one great series of articles written from web developers to web developers! Look forward to reading the whole series. Just need to get down to some serious coding/design. I’ll be following along and making my own app too, hopefully! Nice work! Great Idea, looking forward for the rest of the serie. Great idea, Chris! Looking forward to reading all parts. A wicked tutorial and workthrough….however my lists don’t save, nor does my public url appear to be correct. Have I been impatient (as in, it’s not ready yet) or is something not quite right? Logging out appears to throw a wobbly too. Appears to be IE wih the issue of logging off. Nice To understand core programmer. 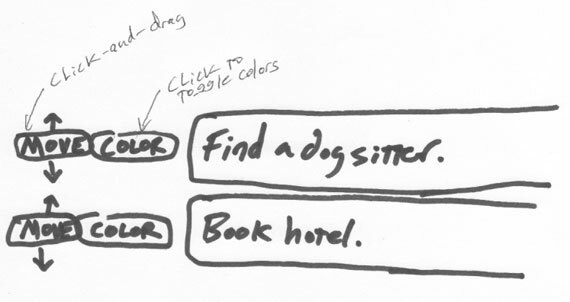 Very nice and detailed series on how to plan a web app. It is a must to stay organized during developement of an app. how can i get the source code of this web application? I have some few errors after i followed the whole article.